SFC William Petit hugs his children at a deployment ceremony for the HHD 210th Military Police Battalion, Michigan Army National Guard, 15 February 2012. The 72 members of the 210th are departing for their deployment to Afghanistan. Photo courtesy The National Guard. There’s no easy way to tell a child that a parent has to go away. 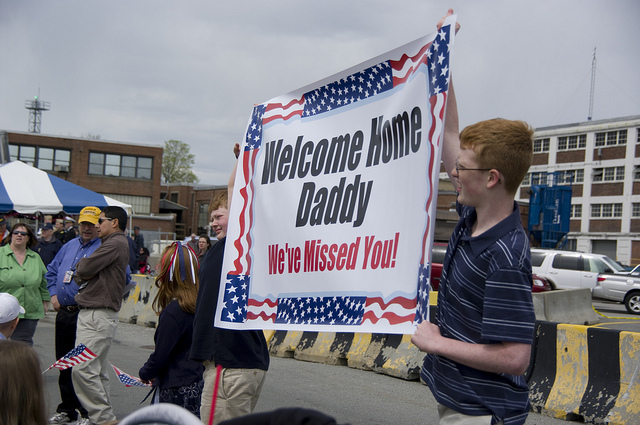 Yet once a military deployment date is set, it’s important to give kids advance notice, especially if a parent’s deployment will involve big changes like a move or a new primary caregiver. Be honest. The words you use are important and can mean different things depending on a child’s age and maturity, so give kids the truth in terms they can understand. For young children, the concept of a long separation is a lot harder to grasp than the fact that mommy won’t be there to take them to school in the mornings or that daddy won’t be back until after Christmas. They often do better with visual reminders, such as a calendar with dates checked off to mark the passage of time. Older kids, especially those who watch the news, may react with a greater sense of worry and fear. Reassure them that people in the military are trained to do their jobs and every effort will be made to ensure safety. Let kids know that they will be taken care of. Kids need to feel protected in a parent’s absence, so tell them who will be taking care of them during the time away. The Maryland Army National Guard held a deployment ceremony Nov. 1, 2012, at the Command Sgt. Maj. Blair Lee Crockett Readiness Center Salisbury, Md., for the Headquarters and Headquarters Detachment of the 115th Military Police Battalion. The Soldiers will deploy for one year to Afghanistan in support of Operation Enduring Freedom. Photo: Maryland National Guard. Young children, especially, may have questions about their daily routine. Be patient if they ask the same questions over and over — repeated reassurances will help them feel more secure. Asking the questions repeatedly simply means your child hasn’t fully absorbed and accepted the information on emotional and intellectual levels. Make a plan to stay connected. Let kids know that goodbyes are hard for everyone — even grown-ups. Remind them that they’ll be thought of and loved while the parent is away, and talk about the people who will be there to help them feel better when they’re feeling sad. Invite your child to come up with ideas to stay connected — from sending emails to promising to think about each other at the same time every day. Try not to overburden. Kids are very attuned to the feelings of their parents, so be aware of any tension and anxiety they might pick up on at home. Also, avoid instructing your child to be the man or woman of the house while one parent is away. Kids need to be kids, even in tough times, so instead tell them to do the very best they can even though it might be hard. Spend extra time together. In the days and weeks before departure, many military parents feel pressure to get the house in order by tackling their overloaded to-do lists. Though fixing leaky faucets and taking the car for a tune-up are important, it’s just as necessary to work in plenty of one-on-one time with each child. The photos, videos and special mementos of these times are what your family will hold on to until everyone is together again. When a parent finally leaves, family life changes and it can take a while for things to fall back into place. Kids are particularly vulnerable at this time, but parents and caregivers can help them through it. Jazlyn Xochitl Torres, 13, and her mother, Gunnery Sgt. Kendira C. Perez, look at photos from when Jazlyn volunteered at an animal shelter. Both of Jazlyn’s parents are active duty Marines stationed at MCAS Cherry Point. Through multiple deployments, one which both her parents were gone at the same time, Jazlyn has excelled in school making her parents very proud. Photo: CherryPoint. Keep the absent parent a part of children’s lives. Whether it’s looking at pictures and videos, saying a special prayer, counting down days on a calendar, finding where mommy or daddy is on a map, making a scrapbook, or organizing an activity your loved one would like, encourage your kids to find creative ways to stay connected to the parent who’s away. Talk often and listen well. Even the most attentive kids can misinterpret information, so ask your children what they’ve heard and then help them correct misconceptions and put things in perspective. Talk to them about the things that upset them and let them know it’s OK to feel worried sometimes. Simply listening — and letting your kids know that you understand — is comforting. Encourage older kids to keep a journal to help work through their feelings. Get support. A parent’s departure is not only unsettling for the kids, but also overwhelming for the partner who must absorb all the extra duties. 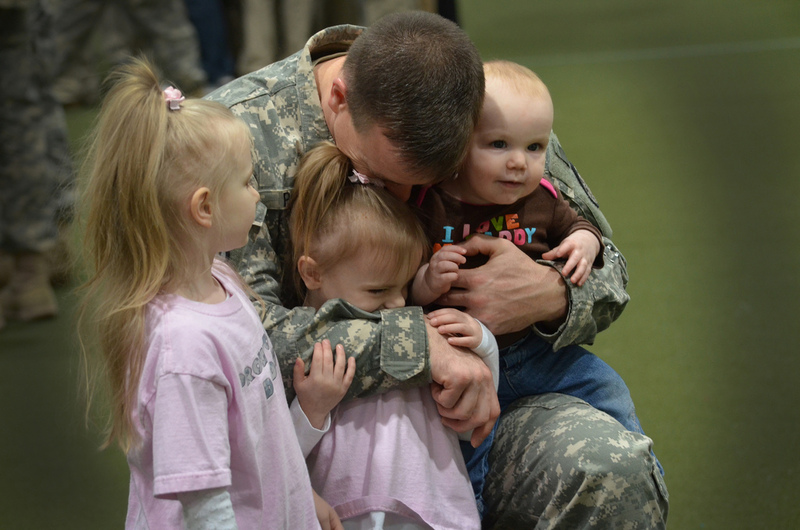 The armed forces have many programs to help families get through the difficult times. Take advantage of them, as well as offers of support from relatives, friends or other military families who know what you’re going through — especially if you’re feeling depleted and finding it hard to supply the positive interaction your kids need. 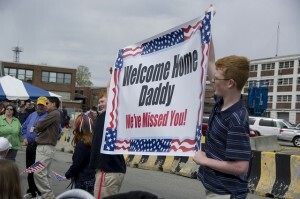 When it’s time for the homecoming, you expect the hugs, excitement and happy tears. But the period of adjustment that often follows can catch many families by surprise. CC Flickr photo by Selbe B. 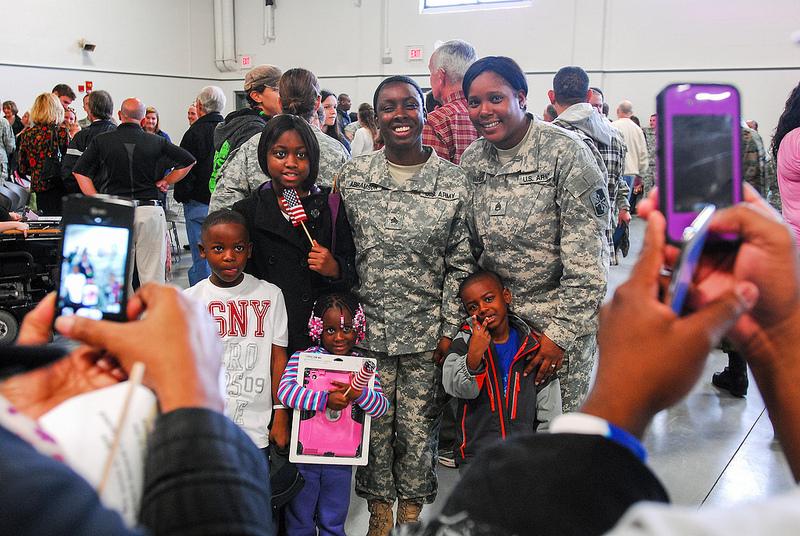 Though some returning servicemen and women slip back easily into the rhythm of home life, most families need a little time to find their balance. Communicate. A lot can change when one partner has been away. Not only are the kids older, perhaps with new interests and routines, but the remaining parent may also be more self-reliant. Many returning parents have a hard time figuring out where they fit into the plan. As with any transition, open, honest communication is key to re-establishing a routine that works for everyone. Give it time. Forget any expectations about how quickly things need to go back to “normal.” Just because it takes your family some time to readjust doesn’t mean you love each other any less or that you won’t get back to where you were before — or even someplace better. Be patient as you get to know each other again, and give the whole family plenty of opportunities to rediscover each other. Take the pressure off. If the first few days and weeks of being together as a family aren’t exactly the fairy tale you had in mind, try not to be discouraged. Putting pressure on yourself or your family to act or feel a certain way will only make things harder. Keep a sense of humor and let the process unfold naturally. A child who’s feeling anxiety may show it in a number of subtle ways. Babies and toddlers may become withdrawn or clingy. Preschoolers may regress in their behaviors or experience a resurfacing of old fears. Older kids and teens may also have a tough time, experiencing decreased appetite, withdrawal from activities, sleep problems and nightmares, restlessness, stomachaches, aggression, anger, sadness and difficulty at school. If your child experiences any of these issues, avoid punishing, scolding or shaming. Children may simply be making sure there’s still someone ready to take care of them. Or they may be struggling with feelings they haven’t verbalized. Plenty of reassurance and understanding — as well as calm but clear statements about what behaviors are out of bounds — is your best bet for getting your child back on track. Try not to take it personally if your child expresses anger toward either the absent or remaining parent. Though hard to hear, some temporary anger is normal when something happens that kids don’t want and can’t control. Help your kids express their strongest feelings in words (keeping a journal is a great way to do this), and continue to set limits on unacceptable ways to express anger. Tell them when you’re feeling proud of their bravery, helpfulness and other efforts. © 2013. Article adapted from The Nemours Foundation/KidsHealth®. Used under license.